Now, that my friends is how you end a series. After the last two books, I’ve learned to just jump into Convicted with a support group handy and a couple bottles of alcohol within reach. There’s no other way to prepare for Convicted. It’s guaranteed to blow your mind away and leave you questioning your own sanity. 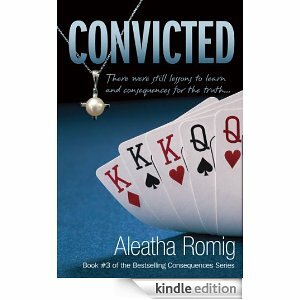 Aleatha did not hold anything back with Convicted. The mind games started right from the very beginning. To say, I was confused & paranoid was an understatement. You find yourself constantly questioning and scrutinizing every character and their motives. You can’t trust no one, not even yourself. After Consequences and Truth, you may think you have it all figured out, but you have no idea. Personally, I don’t think Convicted could have ended any better. The way everything unfolded was pure perfection. It was never any secret that I wasn’t completely on board the whole ‘Tony has changed’ train. Seriously, what he did in Consequences was just too hard to forget, no amount of ‘compartmentalizing’ could erase those events away. So, I was really glad that we got to see Tony’s POV here, we finally see how much he cares and truly loves Claire through his eyes. I thought it was genius on how he wanted to let her go in the end so that he couldn’t hurt her anymore & I loved how Claire showed him her journal to show that she finally stopped compartmentalizing and started acknowledging those past events so she can heal. After all the craziness, it’s refreshing to see the light at the end of the tunnel where they finally have their ‘happily ever after’.